I'm so ashamed that despite the number of trips that I've been to Hong Kong, I've never ventured beyond Kowloon and Hong Kong Island. It's only till this recent trip that we decided to explore on the outlaying islands. Lamma Island 南丫島 is probably best known for its Seafood restaurants. The island has two sides - the West and the East. On the West side is Yung Shue Wan 榕树湾 where expatriates like to reside in this area as it gives a slower pace of life. There's a diverse of handicraft shops and eateries. 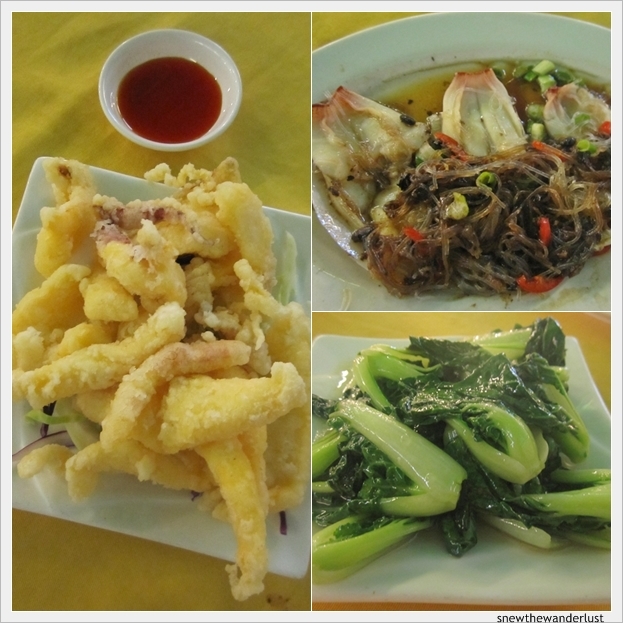 On the East side is Sok Kwu Wan 索罟湾 , it's the famous seafood paradise with a number of seafood restaurants. If time permits, one can hike, actually, just walk from Yung Shue Wan to Sok Kwu Wan. The hiking trail takes about 1.5hours and enjoy the serenity and natural scenery of the island. Well, we didn't have the time and spirit for the long walk in the pretty cold weather - about 12-15degrees. So, we just go to the Sok Kwu Wan, for the seafood, since there's so much hype about this place. From Central Pier 4, Take Ferry to Sok Kwu Wan. 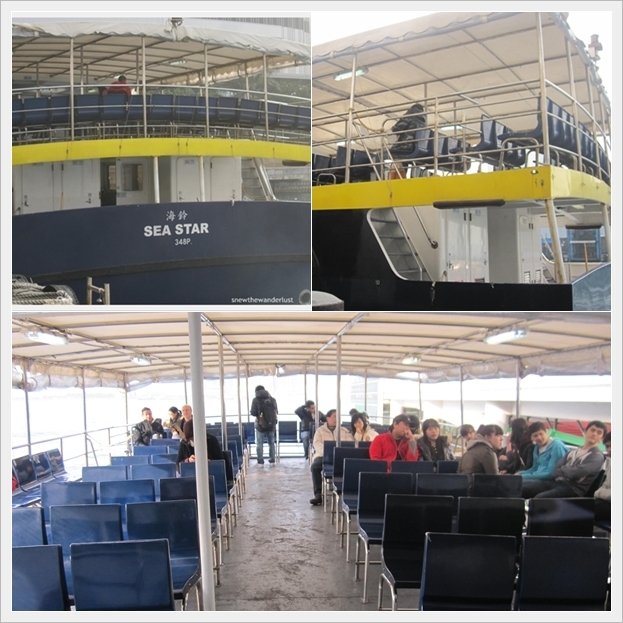 There are two ferry departing to Lamma Island, each respectively to Yung Shue Wan and Sok Kwu Wan. Ferry to Yung Shue Wan cost around HK$16.10 (Adult) from Monday - Saturday and HK$22.30 (Adult) on Sunday. Journey takes about 30minutes. Frequency: Every 30mins or 1hour. Ferry to Sok Kwu Wan cost HK$19.80 (Adult) from Monday - Saturday and HK$28 (Adult) on Sunday. Journey takes about 40minutes. Frequency: Every 1-2hrs. Schedule available on Hong Kong & Kowloon Ferry. This is how the ferry looks like. We took a late afternoon ferry, so that we can explore the island a bit and have dinner at the seafood restaurant. It's quite a breeze 40 minute ride. We really enjoy the scenery. Here are some of the photos captured although it's not very well taken. Spot the Chinese Junk and the DHL Balloon? Is it that high to take the DHL Balloon for a bird's eye view? I doubt so. Just look at the height vs Hong Kong Tallest Building - International Commerce Centre. Hong Kong Island is really congested with sky scrapers. We could see the Lamma Winds as we approach Lamma Island. The Lamma Winds, used to generate green energy plant, is Hong Kong first wind plants. Visitors can assess the Lamma Winds from Yung Shue Wan. Too bad we didn't have the chance to visit this. Doesn't the chimneys look like three huge joss-sticks? Finally we arrived at the picturesque Sok Kwu Wan. The rustic fishing village makes me feel at peace immediately. Ironically, amidst the hectic lifestyle reflected by the tall skyscrapers in Hong Kong Island, one can find peace and serenity on the other side of a peaceful fishing village in Hong Kong. When we reached the pier, we saw a long queue for the return ferry to Hong Kong Island. Well, it's a weekend evening. I guess the locals may have just completed the hike from Yung Shue Wan to Sok Kwu Wan? The perfect place to take a Welcome photo in Lamma Island. Map of Lamma Island. Look at the shape of the island. No wonder it's call 南丫島. Looking at this directional sign, the island may look big. In actual fact, Sok Kwu Wan can be explored in mere half an hour. Walk through the street of Seafood Restaurants. The first that you would see is the renowned Rainbow Seafood. Visitors can visit the Lamma Fisherfolk's Village where guests can have a glimpse of life at Lamma Island while fishing industry still thrived here. Tickets are available from the Ferry Pier No. 2 where connection shuttle boat is available. We didn't really have time, so we skipped it. Continue on and reach the Tin Hau Temple. We spotted a number of people taking this hiking trail. I believe this is the trail linking Yung Shue Wan or vice-versa. Perhaps we should try one of the days. Easy trail suitable for families. Has anyone tried? Do leave a comment if you have. Further on the other side of Sok Kwu Wan is a park. Doesn't this tree looks bare? Guess it's because it's still Winter (although it's only mid Feb). We chance upon this restaurant that seems rather deserted and nobody was around when we arrive. Not sure if it would be open during dinner hour. This restaurant looks pretty old and traditional. I guess the rustic view makes it romantic to spend your Valentine's day. Everything is so old-school. Even the hand-written Valentine's day Menu. Well, V-day was just a few days over when we visited this place. But I wonder who would go all the way to Lamma Island to check-out the menu (which is pasted on the signboard below). Futher up this restaurant was a walking route. Well, it's getting dark (sun sets about 6pm during this time of the year) so we didn't explore further. So, decided walk back for DINNER! With all the hype on Rainbow Seafood, I suggested that we give it a go. This is probably the most popular seafood restaurant in Lamma Island. Rainbow Restaurant has two outlets in the same row of seafood restaurants. The first one when you arrive at the pier, and another one that is near to the centre of the row as it is bigger and somehow looks more appetising. Appearance, afterall, does matter. Hong Kong Island to their restaurant in Lamma Island. Like a young children, I was really excited looking at the variety of seafood. 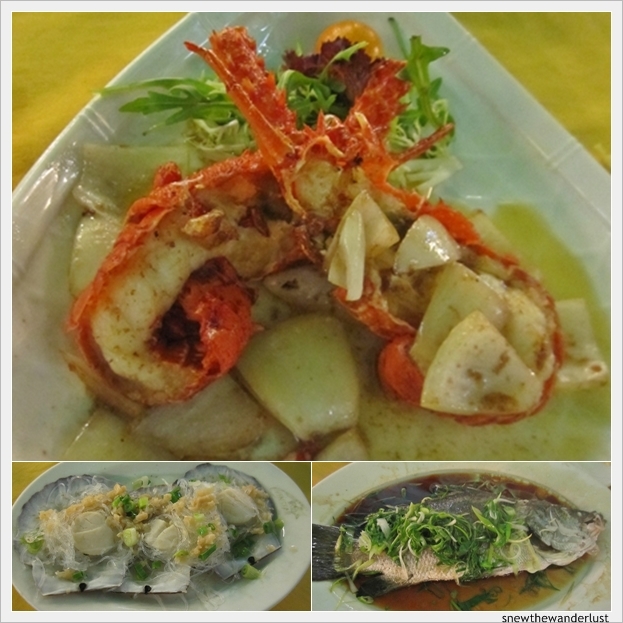 Check out the different types of seafood. Some of them really new to me. Anyone game for Queen's Clam 贵妃蚌? There weren't much guests when we started dinner. However, the crowd started pouring in as the night draws nearer. As we glanced through the menu, it's pretty pricy. So we decided to take the set meal for two at HK$480, and add an additional order of steamed geoduck which Ms Sumo would like to try. The butter fried lobster smells really nice. Doesn't really taste buttery but yet have the aroma in it. I enjoyed the steamed fish the most. It's fresh and doesn't have the fishy muddy taste. I don't really know what's so special about Geoduck. Honestly, I don't know how to appreciate it. It taste the same like bamboo clam to me. Left: Deep Fried Squid with Sweet & Sour Sauce. Right: Steamed Geoduck with Black Bean Sauce. Fried Seasonal Vegetables. 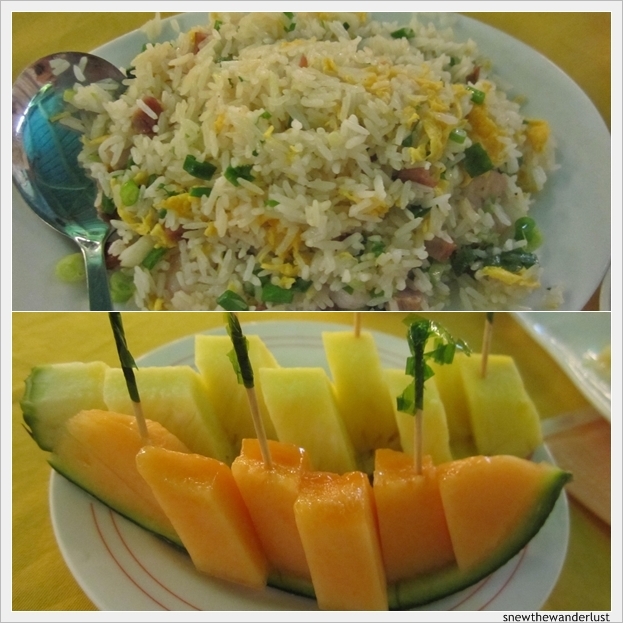 Our meal ends with fried rice and seasonal fruits. The pineapple and rock melon is really sweet. Damage: HKD700 (equivalent to SGD115). Per person less than SGD40. Pretty reasonable with the variety of food we have, including Geoduck, that is supposedly, a delicacy. Honestly, I'm not very impressed by the seafood here. Somehow, it's overrated. Or perhaps, we didn't order the better dishes that are more expensive. The Singaporean in me, still prefer the black pepper crab, the Singaporean style, or even simple dishes like fried sotong (baby squid) would blows me off. All this said, it's still worth a try. After the meal, Rainbow restaurant provides free transport back to Hong Kong Island. We are given a sticker that would allow us to board their private ferry. Business must be good for them to be able to operate a ferry for their guests. You can check out the Free Ferry Shuttle timetable. Reservations are preferred.